In the pioneer spirit neighbors helping neighbors Oklahoma Panhandle Partners (OPP) sponsors the ‘Tough Enough to Wear Pink’ Friday, May 4, 2018. Oklahoma Panhandle Partners continue to help cancer patients of all ages with all types of cancer from Cimarron, Texas and Beaver counties regardless of treatment location. Pre-sales of the popular Tough Enough to Rodeo t-shirts are at Bank of the Panhandle, 3 Wild Hairs, Anchor D Bank and the Guymon Chamber of Commerce office. You may also pick up t-shirts at the OPP office, 312 N. Main, Monday through Friday, 8 a.m. to noon. 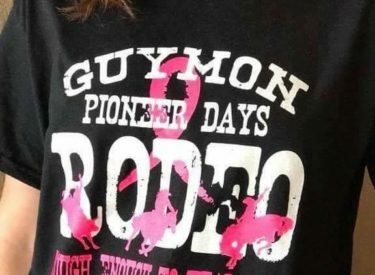 Drop by the Guymon Pioneer Days Mercantile to purchase t-shirts on Saturday. For more information call 580.468.6577 or email [email protected]. Visit our office at 312 N. Main in downtown Guymon, Oklahoma.